People often ask me how I am able to afford feeding my family of six such a wholesome diet of mostly organic foods on a limited budget. My answer: I make almost all of our food from scratch and I grow and preserve as much of our food as possible. I don’t claim to be an expert at gardening; in fact, I often tell people that my garden grows in spite of me. I also don’t have the yard space to grow as much food as I need for my family. Grow what I can, making the best use of my garden space. Utilize my farmer’s market and learn which vendors grow their produce organically and which ones are willing to “give me a deal” when I buy a large quantity. Talk to people. Many people have more apples on their trees and strawberries in their patch than they know what to do with. They are often happy to give me their excess for free. Trade. If I have an abundance of potatoes, I’ll trade it for a bunch of green beans. Or, if I don’t have an abundance of any produce, most people are happy to accept ! During the Summer and Fall seasons while fresh produce is readily available, we eat as much as possible. Any extra goes into the freezer or (and oh wow is there usually extra!). By the middle of October, I have usually put away enough potatoes, corn, green beans, peaches, pears, applesauce, strawberries, tomato sauce and tomato soup to last us for the entire year. Also by the middle of October, I am so sick of looking at tomatoes I don’t care if I ever see another one as long as I live! I soon get over it and begin to realize the fruit of my labor as all throughout the coming months I am able to pull delicious organic foods out of my freezer and pantry for our meals. Our family has saved hundreds of dollars on groceries. I know exactly the kind of food going into our pantry and freezers and then into our bodies. I know what I put into my sauces. I know what soil my food came from. I know I can trust the food to be healthy for my family. Our family gets to work hard together. Planting, weeding, and picking all becomes a family affair. We are a family with dirt under our fingernails! The food is delicious! In my opinion, nothing is better than home grown organic produce! Brand new jars can be pricey, but at yard sales, you can find them for almost nothing! Gardening and preserving your own food is a wonderful way to help provide your family with great quality, delicious, inexpensive produce all year round! Laura Coppinger and her husband have four sons ages 5-12. She blogs at encouraging women daily in the areas of healthy eating, gardening, parenting, homemaking, faith and fun. Would you like some help getting started with gardening and preserving? Well, Laura has graciously offered to give away 10 copies of her ebook, , here today. To enter to win, just leave a comment on this post in the next 24 hours. Winners will be chosen and posted on Monday. Looking for more? Read more posts about Gardening & Giveaways. « It’s Here! It’s Done! The Store Deals Page is Live! Would love this book. We are doing our first garden this year. Expecting twins which will make us a family of 7. Doing some research on saving big time in groceries, and this is something we’re wanting to begin. We’d love to plant our own garden – just don’t have a clue how to start! 🙂 Looks like a helpful book! Beautiful, I love it. very inspiring. I want to garden more. I go to church with expert gardeners, Mennonites, so I am hoping to learn more this spring! Would love to win, we actually built the start of our garden today! I would love to win this. We have just planted our first ‘real’ garden. By real I mean it has more than just one or two types of plants! I could use all the help I can get! I am hoping to have enough to can our sur (once I learn how!). I have high hopes for my little garden! We’ve gardened for a couple of years now, but have not yet ventured into the realm of canning. Although I’ve wanted to, I haven’t been brave enough yet. Would love a copy of this book! I love Laura’s blog! I’ve gleaned a ton of valuable information from it. I’d also LOVE a copy of this book, as we are currently planning our 1st garden! I would love this book, just started some seeds inside for our first garden this year. I love Laura’s site and would love this ebook! I’ve been working on getting the garden ready this week. Planted seeds indoors last week and most have already sprouted. I’m a beginner, though, and could definitely use this book! I need help to start my garden so I hope I win!! I would love to have this book we are doing our first garden this year, and trying to learn to can and do my own preserving this would be a great tool for me. I’d love to do this! I only have enough space to do a container garden of tomatoes, and I’d love to know how to make the most of it! I already commented, but I wanted to ask where is the best place to buy jars for canning at the best price? Aside from a random one here and there at the thrift store I don’t know where to go besides lowes and pay full price. Any help is appreciated! @Heather, I know Sam’s Club has them in a case. It is definitely cheaper than lowes or other smaller places. May be you can check online as well? I would love this book! I’ve had my eye on it for a while, but have put off buying it since baby #4 is due right at the beginning of gardening season, and I’ve decided I shouldn’t add one more thing to my already full plate this year. 🙂 But I’d love to have it just the same. I would LOVE a copy!!! We have been gardening for almost 6 years now. We always have an over abundance of food…but I never thought of canning. Would LOVE this book! I love canning and could use a bit of help to go beyond greenbeans! I’d love this! I could use all the help I can get. Would love this book. Our neighborhood is getting together and planting assorted fruits and vegetables. I currently make my own sausage and bread. I truly want to know what goes into our bodies. I would absolutely love to win! We’re starting a garden this year, carrying on the legacy my dad left behind when he passed in March of 2009. How neat! I’m so excited about getting our garden started and preserving the harvest the Lord provides! I would love to read this book. I’ve been out getting ready to put in our new garden while the weather’s been nice. Sounds like a great resource! Would love to have it! Would love this book!! I have #1 son already and #2 baby on the way in May and would love to put together a garden this year! Started my herb garden last year and am planning on planting veggies this year. I should really get started on that. I would love to have this book~a neighbor volunteered to help us get a garden started, but I am sort of overwhelmed at that thought. I have a family of 6 as well and would LOVE to start eating more healthy. This will be our third year of gardening and second year of heavy preserving. I love that I know where our food came from; God, and the labor of our hands. This is a family-shared money saver and it gives us a lot of time together. I’m always looking for new ideas for canning, preserving, and finding deals on foods we can’t grow here (like berries). This book would be a great help! How inspiring. I have recently been learning about couponing and have saved a lot of money, but I’m concerned about the quality of all of the pre-packaged foods. This would be a great way to get both good quality food and be economical. Thanks for sharing with us! I would love a copy of this ebook! Finished planting 3 pots of herbs, lettuces and beets. Love being outdoors and cant wait to feed my 3 month old her first home-grown tomato in August! Thanks for posting this! I saw her blog the other day and planned to go back to study it. We are trying our garden again this year for 3rd time and hoping that we will actually get more than a tomato or two! I have plants here in the house that we are waiting to transplant…hopefully within the next couple of weeks. I also am looking into how to do canning. Oh, I would love this book! I’ve been expanding our little garden each year and could use all the advice I can get! Great giveaway- We have done a garden the past 2 years but really do not know mush about canning at all BUT saying that I would love to know more about gardening and canning. We’ve done a small garden the last two years and are planning to continue this year. The book sounds wonderful! We are looking into planting our first garden since 2003 this year. We haven’t had one since my son was born, I think it’s time to get back to it. I can’t wait to preserve the fruits of my labors. We also dry tomatoes and peppers for later use. I’m hoping to garden some vegetables and herbs this summer, and I need all the advice and motivation I can find! I would love to get my dirty little hands on this book!!!! We are a family of 6! Hubby myself and 4 kiddos 12, 3, 1 1/2 and 6 months old. I would love to learn how to feed my family more healthier than buying over priced and not so fresh fruits and veggies. I would LOVE to get one of these books! Thanks! This sounds helpful! We’re doing our first p-patch garden since our yard will not fit a garden. Can’t wait to be more in control of what we put in our bodies! I’m trying planting in containers this year since planting in our clay soil has not been successful thus far. I hope to have enough to preserve some this year. Oh this is one I am dying to win. I am in the mojave desert. Gardening is a lot of hot/hard work and with a beginners/black thumb I would love any help I can get. LOL! Thanks for the info and encouragement. The last couple of years the kids and I have grown strawberries and tomatoes. The fresh ones were great, but the tomato juice I canned had mold growing at the top even though it sealed. 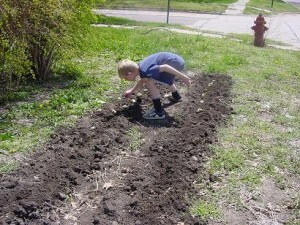 The kids want to expand and plant corn, beans, potatoes, and melons this year. I think your book would help me get it right. Thanks!! I am hoping for a fun garden this year. This book would be great and full of ideas! I try to feed my family well, I am always incorporating more ways of doing so. Gardening is a huge theme for my husband and I this year. We live in the wood, and have had to clear trees to get some sun. With the trees were roots that are just impossible for us, so we are going to be doing large above ground boxes in an 8′ tall enclosure. (Deer come with the woods.) I preserved some foods last year, but not enough. this year we hope to do more. I think the book sounds wonderful for women like me. My kids and I are starting one right now. This would be great to learn from. Just bought my seeds today!! I would love to win this. This is the first year I am going to start my own garden and I could use all of the help I can get! We are just trying to start to get good at this – lettuce and onions are planted right now! I’d love to win a copy. I’d love to learn more about how to feed my family from our land! I grow a small garden. Need help with the canning and preserving. Would love to win; working on the courage to try my first garden! Would love to teach my children and incorporate canning and gardening into our school day! Freecycle is a good place to look for canning jars, too. Also, if you have old-fashioned farm (estate) auctions near you (you can find out at ), they are the BEST source for kitchen and food preservation equipment. Usually, the other people there already HAVE all this stuff of their own, so it goes really cheap. At the last auction I went to, a couple of months ago, I brought home about 6 dozen quart & half-gallon canning jars, for $1–and, at that, they were thrown in with something else that I wanted–a couple of old kids’ chalkboard easels, IIRC. Wear old clothes, and plan to spend the day. Also, know in advance what you’re willing to spend on the items you’re interested in & don’t get “auction fever”. Prices are cheapest when the weather is cruddy, even if the auction is indoors. And yes, you can take kids. The last auction we went to, we just put our 2 year-old & our 16-month-old in the double stroller & packed some toys & snacks. By the end of the day, they were dirty from running around a muddy farm, but they had fun. I would love this book! This will be our 3rd year gardening and I’ve hoping to start preserving some of our harvest this year. we’re planning our garden right now! Can’t wait to get it planted and would love the e-book! I would love to learn more and feel confident enough to try some things this year. This is something I’ve dreamed of doing but have never dared. What a great idea! Awesome! My husband and I have been eager to start canning our own produce and this is great information! Thanks! Please enter me to win. Thanks. I’m going to do some gardening this year. This would be helpful. Thanks! Thanks so much, I just came from the garden, where I have planted radishes, onions, peas, lettuce and spinach. Gardening is great and I always need more information, so I hope I win your book. The e-book would be lovely to have thank you for the offer. I love gardening and canning. I am always looking for new and better ideas. I would love to have a copy of her book. I love Laura’s blog and would love to read her gardening wisdom! I’d love a copy of Heavenly Homemaker’s Guide to Gardening and Preserving – I just started a garden this year! I would love this book! We are moving towards growing enough food to our family for the winter but learning to can is something I’ve been putting off. livingourway at gmail dot com. We’re just starting our first garden! Would love to win… want to start a garden this summer. I’d love a copy! This year we will be starting our 1st garden. I can’t wait t learn with our kids! This would be great! I’m getting the garden itch already so this would be perfect!! Would love to win! Thanks for bringing us such great articles, tips and tricks! This book would be such a blessing. I am trying to start a home garden, but keep getting stalled or discouraged. Would love to get a copy of this book! I have just decided to try to grow as much of my family’s food as I can and really don’t know much about where to start. We live in the city as well, so yard space is limited. I would love this book. Thanks for the information on gardening. wow! i would love this!! great post! This will be my 3rd year for our garden…I LOVE it! It’s really not hard and you learn each season what grows best in your area. I can’t wait to plant again this year. I usually spend less than $30 to plant it and save hundreds every year! I wish I had more room because we don’t usually have enough extras to last very far past the season (if any!). Well worth the effort! We have had a vegetable garden for a few years now (except taking a break for a couple of seasons here and there when I was pregnant). I started with stuff that we eat a lot of such as tomatoes, peppers and squash. I have added other things since then. It has been so much fun and snacking on grape tomatoes right from the garden while playing outside is one of our favorite things to do 🙂 I have never canned though and would love to learn how! This past summer, I bought around 50lbs of tomatoes (I am just estimating here since I bought it at a farmer’s market) for $16.00 and froze most of it. I still have a couple of bags left in the freezer. We just bought our first house, and being a homeschooling family with 3 kids, I would live to learn and teach my kids the values of growing our own produce. Where do I start?!? I love gardening. I always have much more than I can possibly eat. I may have to give canning a try this year. I love this. My family has done a garden and canned vegetables for years. I’m finally starting my own in my small patch of land behind my townhouse!! I’d love a book. Thanks for offering the giveaway! The book sounds like a good one! I really liked your article, too! Love it! Just started growing and canning for my family of five. Sounds like a great book! I would love this book one of the things on my list of things I want to do is start my own garden and learn canning. We have been gardening since we bought out first house and love canning!! Would love to learn more though! This will be my third garden this year. My first did pretty good, but last year my squash and zucchini were gone in a day. Rabbits ate all my beans and I just couldn’t get anything going except tomato and pepper plants. Would love the book! I love gardening too. Square foot gardening works for my family. It’s simple, inexpensive, and nicely organized. What we can’t fit into our garden we pick at our local pick-your-own farms or at farmer’s markets. I love to can. I would love to win! Would love this, me and my husband plant a garden every year bout an acre worth and can’t seem to find the right information on preservering/freezing/jarring what we grow, we’ve tried, but to no avail. would love to own this book! I really need this book. I have wanted to learn how to can for a couple of years now but have chickened out every time I have the opportunity. Thanks so much! I love Laura’s stuff!! We are hoping to get our first chance at growing anything after we move next month =) So excited for garden fresh tomatoes! Would love it! Thank you for the information in this post! Super helpful. Wonderful. We’re planning to garden and hoping to can this year! Looks like a great resource, I would love a copy of this book! What a wonderful post. I’m hoping to expand my little organic garden plot this year. My husband and I are in the process of buying our first house – I can’t wait to have a yard where we can grow our own produce! I have always wanted to learn how to can and with hopefully having a garden – if we are able to move – this would be so helpful! We just moved and I would LOVE to have a garden!!! This would be a great book to have! I started gardening last year and am learning the intricacies of gardening in the mountains. I’d love to learn how to preserve the foods we are able to grow! Thanks for the giveaway! Oh I just went to her website the other day w the green challenge. I would love to learn more 🙂 please add me to contest! I would love this book. I have a few square foot garden beds in our backyard. Ok, I’ll give it a shot. I keep commenting everywhere but I never win anything! Good offer! I would love a chance to learn more about gardening and canning. We garden, but have never canned anything. I would love to learn how. In fact, I’ve already bought the jars and the canner and am just waiting for the right season to learn how to use the stuff! I attempted a garden last year and it was only an attempt. But I learned from my errors. My husband lost his job just as our first daughter was starting college, that was almost four years ago. I have learned alot in four years but am always willing to learn more. I would a copy of your book. Thank you for the advise. I am starting a garden this year, and have NO idea what I am doing (lol)! This would help ALOT! Thanks for the opportunity! I love preserving, and would love the ebook! I hope I win this! I would love a copy of this book, new recipes for sauces made from garden ingredients would be wonderful. My family is already looking forward to our garden. I am trying everything to eat things grown closer to home. I have always wanted to garden and can but didn’t know where to start! Ooh I would love to win this!! I am planning to start my first garden this year as I now have my very own yard!! I would love this e-book. We are starting our first garden this year and I am so excited. Oh how I would love this! We are a family of 7 with no gardening experience. I played around with the idea and didn’t know where to start! This is just in time! That looks awesome. I’m a bit of a maverick gardner and I think this would help me follow more of the rules and be more successful! Would love this book, thanks for the chance! I’d love to win that book. We just bought a house and I’d like to turn a little bit of the yard into a garden. My husband love to Garden but is not very good at it and is open to help. He would also love to start canning to save us money. We just planted our first small garden today! Would love some extra pointers! I would LOVE to have a garden. I’m so afraid it’s going to flop! I haven’t yet found a place to get organic produce where I live! This book would be awesome! we have a garden every year. there is something very rewarding about picking produce that our family grew together. i would love to win this book. We are starting our first garden this year as well, my husband’s work offers plots to use so I am hoping for an abundance to reduce our grocery bills this summer and to have organic local food to eat throughout the winter! This book would be great! Just what I need to help me start canning. This would be awesome for a complete novice! This is something I’ve totally wanted to get into, but feel like I don’t know were to start. I love this giveaway! I have planted a herb garden in the past and grown tomatoes. I plan to extend my garden this year to include strawberries, raspberries and blueberries. I loved gardening with my Mom growing up, and now that I have four kids it is high time to return to our roots!!! I love Laura’s ebooks and hope I win this one! I love gardening and preserving! This giveaway is just what i need. Have a small garden and would love to learn how to preserve! Love this idea! I need some motivation. Would love to win to find my motivation! this would be great, my husband is the main gardener in the family! but this would help!!! Planted my indoor seeds just this week. Only my 2nd year and boy do I need the help!!! I could use all the advise you can give me. Our first attempt at a garden we started in Oct (it’s TX so it still feels like summer). We had a cold winter (rare) and it froze all of our stuff except our cilantro and rosemary and oregano. Would love to win. We garden and have had some success by trial and error, but would like to do more planting this year. I love laura web site. Nice to see a post here of hers! This is perfect timing for me. Just starting to try and plan for our first garden. This is the first time we have lived somewhere that I can plant one. A little nervous about the outcome. Would love to learn about preserving too. I’ve always been interested in this subject! Thanks for the guest post! Just a question if anyone has the chance to see it… what’s the best way to start? I love gardening, but haven’t figured out the preserving part. This book would be a HUGE help for me. I tried to have a garden in pots last year, but my new dog got the best of the pots 🙁 I’d like to try again this year! would love to have this…need some new ideas!! thanks! I recently read the book, “On A Dollar A Day”, and am now reading, “Animal, Vegetable, Miracle” by Barbara Kingsolver. Both books have been enlightening regarding the current mass food production processes. I have a renewed interest in eating more organic, raw foods, and want to learn to can as I try to also eat more locally grown foods. I have wanted to garden since we moved on to our acre lot, but am clueless! This book would be AWESOME! Omg you must be reading my mind. I decided to start doing this, this year. I am hoping that I can save money but I have no idea what in the world I am doing. So, now I worry that I will cost myself money because of my lack of knolage. I hope I do what I need to do to save most of it LOL. Great post – I am going to can for the first time this year! I just love this article. I taught a few of my friends to can this year and hope they will keep it up after the army moves us to new york. I hope to start a garden so I can grow our foods instead of buying every thing! This would be a blessing to our family to have! I would love this book! I am planning our first garden this year! I would love a copy of the book, it would help me preserve all the produce I work so hard to grow! I want to tackle starting a garden and would love to have this book. I would love this book! We started gardening last year to feed our family (and five others), but this year we plan on trying preserving as well so that we can have good food all year. I’ve never tried this before, so having a good to help would be great! Oh, I love her blog, and I’d love a copy of her e-book. Thanks! Oh how I need this book! would love to win this ebook! I’m interested in preserving for the first time this year. Thank you, thank you, thank you for this post!! I’ve bought some seeds and am questioning if I shouldn’t have bought plants instead. I know NOTHING about gardening (I have a brown thumb! ), but am antsy to plant a garden, now that I have a yard (just moved from a place that .09 acres). I’ll definitely be stopping by your site! We just bought seeds and supplies for our first garden today!!! I can’t keep a plant alive to save my life, but I really like the idea of growing and preserving our own food. I tried to start a flower garden a couple years ago and the plants molded before I could plant them out side. I would love a copy of a book that might help me fullfill my desired to grow and perserve by ourselves!! I would LOVE to learn how to tackle gardening. I have wanted to try a large family garden for a while. I would love to learn more about gardening and canning. Oh please let me win this one… we have always gardened and have a CSA and farmers’ market. My husband and I are both likely to lose our jobs and this would be such a great help to us! I would love this ebook! I’m trying to do more of this this year. I am always seeking more information on gardening since I am a novice. I’m a little scared of home preserving but want to try it! I’d love this ebook. I’ve been scouring books on how to start a garden, trying to prepare to give it a go this year. Sounds fantastic! I would love to enter – thanks! This book would be a treasure! Thank you! This is something that I’d love to learn more about! This would be a big help – we’re planting our first garden this year! My parents had an AMAZING garden when I was growing up (they still do, actually). It’s mostly my dad’s domain, but my mom does the lion’s share of the canning. If you name it, it’s probably in their garden. My dad built an extra room in the basement just to store all the canned goods. Wow. I miss that. I don’t really have the space to have such a spread, but I do enjoy my few little tomato and pepper plants!! We’re starting a garden for the first time this – I can’t wait to have lots of fresh produce. Two years ago we put up tomatoes, peaches and pears – but they were all purchased. Last year I think we just did black raspberry jam (=black gold!). I would like to have a pantry and root cellar full of goods to eat from all year. We’re in a house with decent soil for the first time ever — this would be wonderful! I defintely need a little help! This would really come in handy…thanks for the chance to win! We are blessed with the space to garden and will be canning and freezing lots this year! This sure would be nice. I am going to attempt to grow some veggies this summer and am planning to can some things so I’d love a book with good advice and tips! I would love this! We are really wanting to have our own garden. We did our first garden last year and am looking forward to improving on it this year. I would love to have this book to help us out. Would love to win – thank you! This method works! Gardening and preserving your own food is a more economical, health, and tasty way to feed your family. Thanks for the post and giveaway! We just moved into our first house with a real yard and have been hoping to get our feet wet gardening! This book would be a great help! Finally convinced my husband to dig up a chunk of the backyard for a garden this year. This book would really come in handy! this looks like a great book!!! We are planting our first organic garden this year and this book would be a great help. I have wanted to grow our own vegetables and fruit for sometime. The garden will also be a great homeschool lesson for our kids. My hubby is a horticulturist and love to garden all summer. I would love the help in knowing how to preserve the items we grow! Thanks for the giveaway! I would love a chance to get this book! Thanks so much. Just getting into preserving my food. Looks like a great source of information! I would love this book…I’ve always liked the idea of having my own garden but haven’t known where to start! I LOVE her site! I have learned so many new things. So awesome, would love to win!! My 13 year old daughter is working on gardening and home environment as her 4-H projects. Having less than a green thumb myself, we would love to win this book. I would love to have this book! I canned apples last year and have frozen tomatoes from our garden. This would be a great inspiration to do more and the tips would be beneficial too! Would love to read your book!! I recently found Heavenly Homemaker and loved what I found. Then a friend just sent me this link today because on the 27th I will be teaching a Gardening Workshop (here is our flyer – ) and this would be such a blessing to have a copy to keep for myself or give away. How much are these if I don’t win? my thumb is less than green, so i would LOVE the extra tips! I am going to have my husband read your article. This will be the first time we plant a garden. Now there’s even more convincing evidence as to why we should make it organic. Thanks! We just moved to a new home and today I was scouting out where our new garden will go – this book would be a great help! Thanks for the opportunity! What a wonderful family activity! Our family is very similar to yours, six of us, with three boys and one girl ages 11-3. We are always looking for ways to conserve and preserve. This book looks like it could really help us. We’re just starting our first garden. I’m a big fan of Laura’s site and would love to win! I’ve gardened and canned but never tried going organic. Would love to learn how to do that successfully! My family and I would be interested in your ebook. We have had our own organic garden for the past few years and have trouble finding canning recipes for our vegetables. I think your book could really help us out. Thanks for considering us. Would love more info on gardening & preserving! This would be wonderful! We have 3 growing boys of our own who continue to eat more and more as the years go by. Thanks! I would love to have one of these books. And I have a bit of a library here in my rural corner of the world that I share with my neighbors, so several people would benefit. You know, if my luck runs this way. Thanks for the opportunity! Oh man! Considering I’m starting to make plans on gardening, this is the book for me! I’ll probably buy it even if I don’t win! LOVE Heavenly Homemakers and would LOVE her book!! Thanks so much!! I would love to win this book! It would be so helpful to me as I start growing and preserving some of our own food this summer – I need all the help I can get! I was JUST telling my husband we needed to start gardening but we don’t know how!!! This is awesome! My inlaws have a garden and I loved picking the squash and tomatoes to eat. Now that we have our own house I would love to be able to start my own garden and cut back on the grocery bills. Would love this! Last year was our experiment year and am really looking forward to a more productive garden and getting more of it preserved this time around. I would love this book. I always plant a garden, and do some canning. Last year I started visiting the local farmer’s market. I would love to learn how to really make the most of these great resources. I have had a garden for the past 2 years, but I continue to struggle with preserving what I grow. I would love to read her book. It would help me tremendously. I want this book sooo bad!! Pick me, please?!? This is our second year gardening and I am hoping to have a huge yield this time around. I would love to know what to do with all those veges! I do a small garden, but would love to know how to put some more produce in the freezer or can it! We are planting our first garden this year so your ebook would be a valuable resource. Thanks for your post. I’ve never gardened before, we bought our first place this fall, and I really want to give it a try this summer. I have NO clue where to start! Trying to figure out the gardening – would love this! I want to try my hand at some gardening this spring. Bring on the e-book! oooh pick me, pick me!!!! We are moving soon out to some acerage partly for this reason. We would love as much help as possible as we learn! I would love a copy of this book! My family has a couple of gardens each year! I would love to win. I can’t wait to garden this year. I would love to win! We have been gardening as organically as possible for the last few years, however I could definitely use some advice on preserving, specifically canning. I would love to make my own tomato sauce and can green beans. Thanks! This looks like such a great book! I’ve tried my hand at gardening the past few years with my preschooler, and it’s so gratifying to be able to “harvest” our little crop. I definitely want to get into canning and such – esp. now that our family has expanded. Thanks so much for this great offer! I’ve been thinking about doing some container gardening this year so this ebook would be a great resource. This is my first year for a garden. I am very excited. I have been thinking of a garden for years! It seems like such a daunting task, would love to know more for my home environment. I would love to learn how to grow my own veggies. This book sounds great! I am always looking for fresh fruit and veggies. Last year we lived on a busy intersection right outside of Atlanta. This year, we live in a rural area. So, I plan on doing a much bigger garden instead of just a few tomatoes and cucumbers. This would be such a welcome to gift to help me get started. Thanks for your site, I love it! I would love to get this book and learn more about gardening and canning – something I’m really wanting to learn! I have been wanting to do a home garden for years! The task seems like such a daunting one, for my home environment. Wow, could I use this!!! I was born from a long line of women with brown thumbs 🙂 I am attempting a container garden to start with so ANY help would be great. I am a huge fan of Laura’s blog (using Tropical Traditions Coconut Oil in dinner tonight, as a matter of fact) and would love to get some in depth instructions on how to garden and preserve all the yummy results. My gardens never quite seem to work out 🙁 Zuccini is the only thing I seem to be able to grow. I can’t even keep a tree alive in my yard. We are a family of 8 and we garden every year. Last year we put in 3 apple trees and 2 peach trees and 3 blueberry bushes and a whole strawberry patch. Lots of hard work, and it can be so disappointing when the deer just come and snack in my garden whenever they want to! But the Lord is faithful and other’s who had a bountiful crop are always willing to share and I am always here with my arms open! I do a lot of freezing, but I’d love to try and can some jam or pack some peaches this year and this would be a great help! Great article! Springs almost here and I’m ready to get out there! I would love to be entered into the drawing. We recently moved to our new house that includes just under one acre of land. I am so excited about putting in my first garden this year, but nervous too. We are doubling the size of our garden this year and I couldn’t be more excited. I already bought my seeds and started a few. It’s also a great learning experience for the kids. Awesome post. I’ve been wanting to learn how to can. I live in a condo with no yard, so I’m limited to what can grow in a pot indoors and what I can buy when its super cheap in season. Thanks for posting! I would love to win! This is our 2nd year of gardening, and I’d love to learn how to save some of our veggies for the winter months! We’re also expecting our apple and peach trees to start producing this year, too. I’ve always wanted to have my own garden. I bet this book would be great to get me started!!! I would love this book! We are planting our 1st garden this year and don’t know much about how to do it! I wouls love that book. I’m thinking about doing a small garden this year. I’m greatly expanding our garden and my canning efforts this year. This would be a great resource! I love to garden and would enjoy learning from this experienced mother. My garden is just a tiny patch, but I love it. My mom used to can all sorts of stuff, but I never picked it up. I would love to learn now! i need to get reading about what to do with a garden. i’ve got seedlings coming april 1 and no idea what to do with them! i would love a copy of the ebook. seems it might fit my needs better than the gardening for dummies book i was going to get. Hi. I would like this resource! This sounds great! Please sign me up! This is our first year gardening with my folks, so our garden plans are big. In spite of a natural black thumb, I still plant a garden every year, and I learn a lot every time and we get some food out of it, too. I would love a peek at Laura’s ebook. Our garden gets a little bigger each year and last year I did a decent amount of canning. I’d love to read the tips in Laura’s book! I would love to win this book as I have been wanting to plant a garden and the timing would be perfect. I read Laura’s blog daily. I really enjoy all of her recipes. We would really love and need this book lol. We are planning our first “real” garden this year and need all the help we can get! !Thanks for a chance! I would LOVE to know how to garden and can better. My grandparents always have an overabundance from their organic garden every summer, and I hate it when food goes to waste! I would love to win this. We have a garden and I have a lot of cans, but we have yet to plant anything because we don’t know what we’re doing! Hopefully we can get it started this year!! We’ve had a big garden for the past three years and I want to have an even bigger garden this year. I would love to read the bood to get some pointers. Would LOVE this! I have planted mostly tomatoes in the past, but don’t get a very good yield. I definitely need some good advice, and this book sounds like just the right thing I need! 🙂 Thank you so much! This is right up my alley! I love to garden and hope to start canning and preserving this year as our family begins to grow. Thanks for this offer/contest!! I am a new gardener this year, have canned before but bought my new pressure cooker, so I am already for the book! Sounds like a wonderful book. I had a garden a year before last with help and didn’t do one last year. I’m ready to start anew and learn as I go so I can teach my children!!! i would love to win.. 🙂 i don’t know how to ‘can foods’ but would love to try. I am making all our own baked goods and trying to buy the best produce possible. We are getting ready to start a larger garden this summer although we are unsure how to keep the deer away. I would so enjoy winning this book! I had a ton of tomato plants last year, but due to all the excess rain we had they picked up a fungus that rotten them from the inside out. Would love your tips on doing organic successfully. OH this would be great! Thanks for the opportunity!! I would love this! We’re starting our first garden this year. We are in the process of planting our spring garden. This book would be great! I would love this book! We’re putting in our 2nd garden and I’d really love to learn how to can. I love Laura’s blog, too. Thanks for giving away her ebook. This would be a life saver for me. I want to start my own garden this year but I don’t really know where to begin. This is a long term goal of mine and honestly I don’t yet know where to begin! I would love this book! We are clearing off the back of our property tomorrow so that we can start our first garden. I am so excited. I am also very interested in preserving. Oh man…I am soo into this! I would love some help and motivation!! Count me in! I’ll (hopefully!) be needing this info in a few months. This looks like a great opportunity to learn how to make the most of my yard and my budget! I would LOVE to win this! This is our 2nd year of gardening, but I have no clue when it comes to preserving! I’m off to check out her blog, thanks!!! I have 72 plants sitting in my living room popping up through the dirt and hoping for ideas to do with the produce…winning this would help tremendously! I’m a wannabe gardener who has yet to find success with my own garden. this book may be just what i need! We started our first garden last year and we definitely need to learn how to make the best use of our space and canning is something that we would really like to learn about! Plus we are trying to eat foods that are organic, but that gets expensive, so we want to be good stewards of our money and grow our own food. So this book looks very useful and informative. Hopefully we’ll get one today. 🙂 Thanks for all the helpful posts. I’ve really enjoyed the shopping help, the heads up on coupons and deals. Already this month, I’ve reduced my grocery bill by 33%. Hopefully I’ll do even better next month! I’d really like to try this although it may be too late for this year? Thanks so much for the chance! I would love to learn more about preserving the foods we grow in our garden! Me and my husband have been planting our own garden for 3 yrs. now and last year started canning and freezing some of our produce, but I would love to do more this year and I could use some help. Hope to win this helpful ebook. Would love to win this book!! Thank-you! This is my dream, to grow our own food in our own garden! Would love to win a copy! sounds like great info, would love a copy! I just ordered seeds and plants for what might turn out to be a very ambitious garden. With a three and a half year old and one year old twins, I’ll need all the help I can get! I am very excited about this giveaway as I have just checked out tons of books on canning and preserving from my local library and to own my own personal copy would be wonderful. I have aspirations to be a homesteader so perhaps one day. I thought canning would be a good starter. Would love to learn more on gardening. What a great post and giveaway. I can’t wait to plant my garden this spring. loved her info and would love to know more…scared of canning myself truth be told! What a help this would be to our family! I would love this book! My boyfriend and I are determined not to go into debt. That means when we get married (and before we get married! )we’ll have to cut all the extra expenses off our budget AND the garden will have to be big and the canning and preserving top priority! this will be my first year gardening on our own property, in the past we’ve gardened with/for other people. I’m a little nervous about staying on top of things, but am excited to do even more canning this year. We had our first garden last year and had a great year with tomatoes so I quickly had to start figuring out how to can and freeze them! This year we are expanding to more veggies and I am trying to plan ahead to know what to do with the excess so that it will last through the winter. Very interested in this e-book. This is my second year gardening and I am always looking for new ideas. WOW! I can’t believe all the comments! We are starting our first garden this year also. I have been saving jars and planning. There is so much information out there that it can get overwhelming. I KNOW Laura has simplified it so I would love to win her E-book. I’ll take any help I can get when it comes to gardening and preserving. We’ll be planting a garden for the first time this year. We just built garden beds this week and I’d love more tips for saving our extra veggies! I love to read Laura’s blog. I would love to win this. We just purchased raised garden boxes to start a garden this year. Laura’s book would sure come in handy. Wow… this is great! Thanks so much! Although in an apartment, I do have a decent-sized deck….you’ve gotta start somewhere! I love her blog AND I’m starting my first garden this year! This book would be great! I am new to gardening and would LOVE a copy of this book! I have never canned anything before and my budget definitely needs it. Any help I can get would be a blessing from the Lord! I would love a copy! My mom and I are really wanting to garden and we would have to start at the very beginning. We haven’t done it before and can use any help we can get! Count me in…I am starting a SMALL garden this year and could use some help! Oh, I LOVE Laura!! Love her blog, her frugal and healthy ideas, her recipes! Our family moved onto a 5-acre “farm” last Spring, so this is our first year to really have a garden at our new home Would be thrilled to win a copy of Laura’s ebook on gardening and preserving! I just started canning last summer and I love it! I’m so excited to learn and do more. I just started canning and would love to learn more!! Great giveaway! 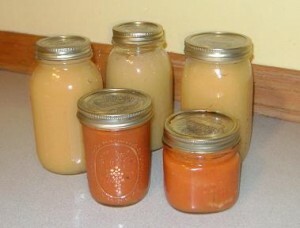 My husband discovered canning when we found a local apple farm that had an early frost and apples were 28 cents a pound. He canned 25 jars of applesauce in one weekend. MMMMM. We are also doing our first garden this year. Love that I know exactly what in the food we sever our family. Thanks for the great article. Cant wait to build my own garden this year w/ the little ones! 🙂 Thank you! We plant a garden every year and always have so many tomatoes! We would LOVE this book! This would totally help me with my gardening/canning goals. Thanks. I’ve always wanted to have a garden. We just bought a house and I don’t know the first thing about getting started! We built a vegetable garden last fall and are looking forward to planting in it soon. This book would be very helpful to us! Would love this! Last year we preserved lots of peaches, even more pears along with 2 kinds of pickles, relish, cranberry sauce, salsa and tomatoes, but not nearly enough! We would love to preserve more this year, and with peaches being the first thing available I am already making plans as we are almost out of canned peaches and peach chips even after rationing them! You are such an inspiration! I’ve love to win! For those who have limited gardening space, (and even those who don’t!) you should check out the Square-Foot Gardening concept. There’s a book out about it, but you can also learn about it online. It’s a really great way to maximize your production in a small area. We’ve been doing it on our small city lot for three years now, and we get enough food to share with the neighbors! We would love to have this book to give us the know how…we are inspired! Would love to see her jam ideas, as well as a good spaghetti sauce! Books would be great to use this year. Thank you. Strongly considering a garden…need all the help I can get! Thank you! Ahhh!! I want to have a garden w/ more than my dying tomatoes this year!! I’ve started growing tomatoes inside already! Along with peppers and herbs! I’m planning a large garden and am hoping to be able to can a ton (will be my first time)! I’d appriciate any help!! I would love to read this book! What a neat thing to do! Love it! Please enter me for this great info! Can’t wait to get my garden in this year. I would love this! Thanks for the chance. A vegetable garden and canning food completely intimidates me. I would LOVE a how to guide that tells it to me in baby steps! Can’t wait to get my garden started, this would be a helpful book. I would love Laura’s book! I only have a small space to garden but love to cram it as full as I can. This book would be a great help. Thanks. I’ve learned on my own, but would love some tried and true tips! I want to garden but I dont know how! I SO wish I had paid attention when we lived with our grandparents as children…..they did all this with such ease and grace! I’d love to win this! Laura is fabulous!! Love to eat organic, but it is wreaking havoc with our food budget. I’d love to have this e-book to help me preserve our own! I would so love to learn more about this! My parents had a really large garden when I was little and as a result I have always loved veggies. Unfortunately I was very young and didn’t retain much of the information or inherit the green thumb. Been thinking of starting a garden this year since we’re moving from our apartment into a house with a back yard! Would love a copy of this book! Would love to win this! We love to garden! Would love a copy of this. Love all of Laura’s blog! Really am trying to move my family toward more healthy eating. I think we must be two peas in a pod! 🙂 Would love to read your book and learn more about providing for our family. desperately need to win this book! Oh please, please!!! I am planning on starting a garden this summer and know absolutely nothing about it. I need this book!!! i really need to read this ebook! i am in the process of planning our garden right now! we’ve had gardens in the past but not much planning ever went into the amount of plants and seeds, or location of it…not this year, I’m determined to make it GREAT! I’d love a copy of this book! I’ve done gardening in the past, but haven’t found it to be very cost efficient. Hopefully this book will help with that. I am so excited to be finished with apartment living someday so I can start growing my own food! I’m eager to learn canning. Thank you for this great post. Would love this. We just moved from a location where we had 15 farms in a 5 mile radius, and we would get leftovers not sold at the end of the day. It was wonderful! But I have no idea how to grow anything myself, now that I need to, or how to preserve anything. This book is just what I need. I finally have gardening down, but I definitely need help with the canning! I have not had a garden since I was a child until this year, our first in a house since. Each day I am amazed at the progress. It feels great to get your hands dirty. I would love to can something from the garden. Just bought my first canning jars, this would help us out a lot! I’d love this! Thank you! Gardening is a wonderful family project. This e-book sounds great. Thanks for the opportunity to win one. Would love this book… I am planning to do a garden with my son this summer! I would love this book to get me started! What a great giveaway! We just started our first garden last summer, and we’d love to get some ideas about how to preserve our extras. Thanks! I would love this book to get me started. Missionaries to Mexico. Would love to put in a garden and can. Would really enjoy this book. I would love to get a book. I’m trying hard. This is my second year of gardening. I need that extra oomff to get me going to the preserving section. This book would be that! Thanks for the opportunity. Would love this book-can use all of the help I can get! I am a beginner at canning, applesauce making, and sweet corn freezing. It is a lot of work, but I love pulling it out in the middle of winter to get a reminder of the summer sunshine! Just planted my first garden last summer…..so need this book!!! would love to start gardening this year. I would LOVE, LOVE, LOVE to win this! I’ve been following the Heavenly Homemakers blog and absolutely love it. I also started gardening last year, but want to do way more this year. Sounds amazing! I’d love to win!! Oh man this is super cool – we are just beginning our first attempt at gardening…seriously my seeds are germinating in the pantry LOL! We would love the advice and help from the e-book! The garden is in, and would really like to learn more about canning the fruits of my labor. Awesome giveaway… i’d love to win! We would LOVE to win your ebook, Heavenly Homemaker’s Guide to Gardening and Preserving! We just purchased all the wood to make raised beds for gardening. Due to my health issues we have chosen to use raised beds that are 12 feet long and 4 feet wide that we will rub with linseed oil which is much more natural and safer than pressure treated wood. We have chosen this method of gardening so I have a place to “perch” while working in the dirt during planting and weeding. I am desiring to get back into using the natural resources we have. We desire to make a difference in our health AND our pocketbook! We will be writing about our adventures on our website hoping to help others learn from our trials and errors all while enjoying the process. Hopefully with much success! It will also showcase how one can have a natural garden even while living in the city. We will also link to other info that might be helpful to our readers! I’m a newbie when it comes to gardening. I only have herbs right now, but would love to branch out! Oh man, would I LOVE to win this one!! I am planning on taking my first stab at gardening in containers (since we live in a townhouse) to try to save money for my family of 7. Any help from Laura would be awesome! Thanks girls! I’d like to learn about gardening and preserving. Looks like a great resource. Thank you. I’d love to enter! Thanks for the fun giveaway! Great article. I cannot wait to check out her site. I would love to do more gardening. Never been my strong point, but would love to make it one. Better food, better bonding time and saving money are all good things. Maybe her book could help me on this journey. Thanks. Thank you for the chance to win. I garden GALORE. Winning this would be such a Godsend! Taking care of my 89 year old mother has really helped me to pack on the weight and limited my activity level that I desparately need to loose what I can. I totally believe eating healthily will aide greatly. I need to learn to how to grow more veggies than I know how now and I definitely need help in learning how to preserve. Fingers crossed!!! Oh, I would love to win this. We hope to start a garden this year, and I don’t know where to begin. I’m planning my first garden now and would love to add this book to my gardening and preserving library. I would love to win this book. I started my garden last year and it was great for the summer, but once gardening season was over I didn’t have anything left, because I have no idea how to preserve any of it, help! I rarely leave giveaway comments, but this seems like such a neat idea. I would love to have a garden grow in spit of my black thumb. This sounds awesome! I am new at all of this and your book would be a great tool for my family’s future! We are starting up our square foot garden, year 2, this would be a great help! Thanks! I am just starting my second garden and really want to get enough to learn to can and preserve. I am so new at this and would love a copy of your book! This is our first year trying to start our garden. I would love to learn more about it! I would be so appreciative if I had a chance to win this book. What a great idea. Oh I would love this prize! I started growing simple things like tomatoes and bell peppers a few years ago and my husband has since gotten a green thumb and grows all kinds of things, I need to get better at preserving our fresh produce!! I have always wanted to learn how to preserve. We are struggling financially and would love another way to eat better and save money at the same time. Thanks for offering up your ideas! did my first garden last year…my trials and errors year. I also did my first attempt at canning and freezing and dehydrating, more trials and errors. I would love this book! I want to start gardening to save money and also eat organic. I love your site. I would love to win a copy of her book. I’m a relatively amateur gardener and canner. We’ve just moved to an area where gardening is supposed to be a lot easier (i.e. things will grow =) ) than the Oregon coast where we last lived, so I’m starting to plan things like what can grow in containers in our rental home’s yard and hoping to find a great deal on a pressure cooker to put up more food. I put up a few jars of applesauce 2 seasons ago and about 16 pounds of peaches last year (though most were given away when we moved due to being put up in the freezer… I still have 2 jars!). I love Laura’s blog & didn’t even know she had this guide! Please count me in! Thanks!! I would love to learn the art of canning. My grandmother always did & my dd just asked today if we get to grow our own food again this year. We do a garden every year, I would love to be able to can some of our delicious produce! I would love this book. We garden and I grew up gardening BUT preserving is new to me!!! I made jam last year but I’d love to learn more! Love to garden and put up the extra we have…Would love to get the book as there is always something new to learn. If you have any older relatives or friends they can be a great source of canning supplies as well. When my world turned upside down and I became a country boy’s wife many years ago several of his aunts and great-aunts were old enough they no longer wanted or cared to can any longer. That being said (and as those turns and twists in life take us) I went into the corporate world for a decade or so and didn’t have a garden, can or anything of the sort. Now I’m back to the farm, putting in our first garden in a dozen years, couponing, canning and frugal living as well :). There are many things to re-learn along the journey and I’m looking forward to a fresh start! I would love to learn how to have a garden of veggies! I would love this book, I have already wanted to try canning but have been too scared to try. This would give me the information I need to do it right! I would love to have a copy of this ebook. I would also like to know how you make your tomato soup and can it………Hubs does not care for my recipie, let alone trying to can it. This is just what I need! I am hoping to do this for the first time this summer and need all the help I can get!!!! Thank you for this post! I’m starting my garden soon and would love a copy of this book! wow!!! I would love to learn and get this E book. I would love to learn how to can produce. Now I need help on overcoming that so that I can use everything I grow this season. Nice giveaway, thanks for the chance. I so want to learn to garden and preserve. Great guest post! I am taking my garden to a new level this year and would love to win this book. Thanks! I’ve got all the equipment…..just need some help on what to do with it!! We are a family of 10. I am self taught when it comes to garden preservation so I could use any help I can get! I definitely didn’t preserve enough food last summer to make it through the winter. I have been canning for many years and now help my daughter by “putting up” for them in exchange for produce! The book looks like it would be very good and helpful! Thank you! Would LOVE this book – I am a wannabe gardener at best and would enjoy getting more from the ground. Thanks! Hope to start a garden this year. Book would be helpful. Would love to have this book and learn about organic gardening. Would love to win & get some new ideas! I would love to learn more about preserving food! Hi! I look forward to planning, planting & preserving for my family! Thanks for the great website. This is our family’s focus this year. This would be an awesome help, and what a great resource! We are planning to start a garden this spring and have already started composting for it! We could us all of the help that we can get! thank you! This is something I plan on getting into, because I’m going to start being a stay-at-home mom and want to save as much money as I can. We grew a garden last year and loved it. I would love to learn more about saving and preserving our foods! Sounds like a great giveaway! I love gardening! GREAT post! We garden too, and the benefits are wonderful. My son and my husband have enjoyed spending time together lately getting everything ready for planting. Thanks for sharing! I LOVE Laura’s blog and am a frequent reader there too. I’d love to be entered into the drawing. Looks like a great and informative book, I’d love to win it! I started gardening last year, and love the rewards of growing my own fresh veggies! This will be our second year to garden.. whith nine kids we eat just a lot of everything.. I would love to have a chance to win this ebook! I would love to have a garden by next year. My kids love fruits and veggies, so it would be very beneficial as they get older to grow as much as I can. I have a brown thumb, so to even think that I could grow veggies and do anything remotely close to what’s in this post is amazing to me. I’d love to be entered in the drawing! I would love this book. So far I am only canning tomatoes, applesauce and jam. I’m a little scared to attempt anything eles. This book sounds fantastic! I have been wanting to start a garden but have no idea how. My kids would love to do this project with me as well. Love your sight also msm! We are planning our first garden this year and I would love to use the tips from this book! We just moved and now have the space in our yard for a garden. I love cooking and feeding my family fresh nutritious meals but don’t know how to get started. This would be very helpful! I love to garden and remember helping my grandmother can jars of fruit from her many fruit trees in the backyard. Homegrown produce, there is nothing like it. I would love this book! Thank you for the opportunity! I used to can fruits and veggies years ago with my mother and have gotten away from it. I do hot pepper jam and strawberry jam, and that’s about it. When I read this article and saw that she made her own tomato soup, that got me thinking…..We started the “square foot garden” method last year and LOVE it! It saves on space and weed pulling! We have never had such beautiful green peppers. I would enjoy reading this book for sure! I’ve been wanting to plant a garden for several years now. I am hoping that this will be the year! This is going to be my third year for a garden. I’d love this book. We started a garden last year, and the only thing that grew really well were the zucchini. I’m hoping we have better luck this year. We’re planning on starting a garden this year to help offset grocery costs. I’m definitely not a green-thumb so it should be interesting. I’m breaking ground for my first garden next week. I’m excited (and a little nervous). I think this book would be a terrific resource for me!! I’m a light gardener and canner. Would love some guidance on making both more a part of my family’s routine. Thanks for the chance to win! I would love this as our family needs all the help we can get! I would like to try canning this year so this would be a great resource! I canned hundreds of jars of mixed vegetables, fruits, jellies, pickled beets, etc. for years thanks to my granddad who had a 1+ acre garden. Now, that my children are older, they want to get back to basics too! By canning our food, I knew exactly what was going into each jar – God’s Produce & My Love! Any size garden will save you money, I would love to have a copy of your book to pass on to my daughter who just got married 5 months ago. We just started “planning” our area for organic gardening. This is a great post and now I know what is in store for us! I have tried to garden last year and I was not very sucessful. I have a problem with ground hogs and they ate everything except the potatoes. I would love to learn how to preserve and can vegs. I do buy local corn and freeze it but that is all I know how to do. @Andrea, groundhogs are a pain we have had the same problem the only solution I have found is eliminating them. However if you put a fence around the garden (I use chicken wire) and stake it into the ground it seems to help they don’t usually dig under it but prefer to lift the edge and squirm under. They seem to like seedlings and sweeter stuff like cantilope more than other stuff. Rabbits will also eat your seedlings. We’re are trying to get a garden going this year, but are a bit overwhelmed, since we don’t know much at all about it. I’m sure the book would be very helpful! This book would be a fantastic way to start off my gardening and preserving endeavors! Recently purchased home on 5 1/2 acres and ready to grow lots to feed my husband, myself and our 3 sons!!! What a great resource! This is our family’s (of five) first year to garden and with a very small house and virtually no freezer space, we are VERY interested in learning more on canning. This book sounds like a great place to start! Every year we have a large garden, and we’ve started to do more and more canning. I would love to learn more from this book. Thanks for this great giveaway! I plan on starting my first garden this year so this book would be a great help! Would love to read it. We’re getting ready to start our garden this year! I’m wanting to increase our garden and start using more homegrown foods. Would love to learn more about preserving what we grow. We have talked about this each year and hope to make it reality this time! I did have a few pepper plants and some basil last year and I loved that. Would love this book! We have had a small garden for a few years but plan to really expand it this year. I would love to start canning as well. I have wonderful memories of all the delicious canned fruits and vegetables from my grandmother’s garden. I have not had a garden before (other than my grandparent’s) and I plan to start one this year. I’m a little scared of canning but hope to learn it soon after. Wonderful post. Can’t wait to read the book! This is a great offer and I can’t wait to start growing and canning. There’s something peaceful about having a garden. My mother-and-law has one and it’s always pleasant to go and pick out some fresh greens and herbs to prepare for supper. For a family, not only can this save a lot on money (I also like the mason jar idea for preserving), as you mention, you know what’s going in your family’s bodies. There is a lot of produce being ‘juiced’ up these days and I find it weird how you buy basic items at your local store that should be available locally but comes from the other end of our planet. Bartering or trading with friends is also a good thing to get into. My wife loves going to farmers’ markets because of all the fresh produce and wholesome foods. New to gardening and canning and would love to win a book! Would love to win! I have only canned tomatoes and green beans from the garden and would love the help of learning how to do more. I love my garden!! Can’t wait to get out there! Gardening is a great stress reliever for me until something goes wrong like all the rain last year and tomato blight uggghh. I have been gardening for a couple of years now and find the benefits of eating organic wondeful. When I stopped eating organic due to working in a diner I felt terrible so I am ready to get back on track and would love any extra help teaching me more about gardening. I have been intimidated by canning for years! This book sounds like a great confidence builder! This book looks really interesting! I am getting married and buying a house this book I think would be great, I am interested in canning the stuff from my garden this year, to help out with our small budget this year. I might have to get this book either way! Thanks for the info! i would love more information!! blessings!! I would LOVE any help I can get. We planted for the first time last year, just tomato plants and we loved it. We want to expand this year but I have no idea where to start! I’m betting this book would help immensely. I could use some help getting started. Perfect timing, we just picked up our CSA box! I love gardening! Last year I started square foot gardening and plan to do it again this year. I haven’t taken time to learn much about preserving, but I’d love to! 🙂 Thanks! Would love to know more about canning! I would enjoy this book! It has been a couple years since we canned or had a garden. We have recently moved and are working on simplifying our life and saving money. Looking forward to getting back to gardening and preserving. Thanks for the encouragement! Would love to win a copy! We started our seeds for the garden two days ago, we’ll definitely need to can this year. Would love to have this to read!! My husband and I started a garden this year and I’ll be doing my first attempts at canning/preserving. At this point I’m expecting to freeze most of the veges for the ease as we both work full time and go to school. Thanks for the great posts to encourage us the worth of it all. Would sure love this book for our family and help me with gardening as i will start and continue to freeze and can my produce; right now I am going by ear with my grandma but need extra help! I’ve been eyeing Laura’s ebook since it came out! Thanks for the chance! What a great give-away! I’d love to learn to garden! Would love the book. Thanks. Would love to read her ebook. Thanks! I LOVE to garden and would appreciate any insight! THANKS! These words made me confident that we made the right decision to start our own garden this year! We have been ‘googling’ how to start a garden and trying to take notes the past 2 weeks. This book would be SO helpful! We have two young sons (3 and 1). Our 3 year old won’t touch vegetables and I really hoping that by involving him and letting him see what he can grow that he will want to eat the ‘veges’ of our labor! Thanks for this post! I’ve been gardening for many years, but would love to learn how to preserve our abundance! Hello Spring! Catching the garden fever! 😉 I would love to win this book. I would love to win a copy of this e-book as preserving will be a new venture for me this summer! I would love this book. Last year was our first real garden year that we started really perserving. Before that we just gave away the extras. Thanks for the opportunity, would love to win your book! I would LOVE to have a copy of this book! It sounds like just what I need for where our family is right now. Thanks so much for hosting this giveaway! Would love a copy. Our first garden didn’t turn out so good. Thanks for the chance. We are planning to start our seeds tomorrow! I can’t wait to garden! We just bought a house in July with a huge yard. I’m starting a large garden just so I can grow my own veggies and was going to learn how to preserve so we can have fresh veggies all year. Winning this book would be a great help! I’d love to win this ebook. We’ve just bought a dehydrator and love it. I want to get into canning but have never had any experience with it – it seems a bit daunting to me! I’m sure this book would help. Thanks! I love to garden! It’s a great activity to share with my family. I love reading Laura’s site and would love to win this ebook as we’re trying to grow more of our own food! Thanks! I would LOVE to learn how to preserve. My husband and I have moved 4 times in the past three years, and I can’t wait for us to settle down in a place with a little bit of yard so that I can finaly start the garden I have always wanted. I grow basil, parsley and some other herbs in a planter on our porch, but it will be wonderful when I can finally grow vegetables. The book would be a wonderful way to get me excited about planning for my future garden! This would be a great win. My husband expanded our garden this year (it’s HUGE now) and I know nothing about preserving and canning! would love to get this as i’m hoping to attempt canning this year. Understand completely about the safety issues, I want to know what we are eating is safe! Sign me up, I need all the help I can get! I grew up gardening, but always feel like veggies end up going to waste if we can’t eat them right away or freeze them. I would love to find out how to can and preserve my veggies! I would love to learn more!! We put out a big garden and do our best with putting up tomatoes and corn but I would love to know how to put up a variety of foods for the winter!! We would LOVE this book. We don’t have land, but I’ve just ordered some “Earth Boxes” to try and get on that road. I’d really enjoy your book! I would love to win a copy. I’ve been thinking of doing a container garden for a while. Thanks! I am a big fan of both Crystal and Laura’s blogs. I would really appreciate this e-book, because I would like to start a garden, but have absolutely no idea how. Thank you for considering me. Oh, I hope I win! I’ve gardened a little bit, but really have no idea what I’m doing! Would love to have a great tutorial to guide me more. We would love this book! We are trying to begin a garden this yr for the first time for the health benefits, family time and especially for the expected financial benefit! This would be a wonderful resource as I’m planning to syart a garden this year! We have been growing herbs, peppers, and tomatoes for several years. This year I’m thinking about joining a CSA since we don’t have a lot of room for a big garden. I would love to learn more about gardening and canning. Would love to read more about this. I get excited about the smell of fresh dirt in the spring. Love flowers, but would really love veggies in my pantry/freezer! I would LOVE a copy. I am trying to do my first garden this year, and I’m worried I’ll give up before I even start. The book would help a ton! What a great post and nice website! We don’t have a yard fit for growing, but we run a CSA group (COmmunity Supported Agriculture) for our city, partnering with an Amish farm near here. I get so much satisfaction out of opening my pantry (and freezer!) and seeing all those jars in there of food I have preserved for the winter months!!!! This would be a great asset and an awesome book! Wonderful! I’d love a copy. Also, If anyone has suggestions on how to do gardening with little space, that would be great. I have very few places in my yard that get sun. I do pots of berries and herbs, but are there other ideas? Thanks! This is great! We have had a struggling garden for the past couple of years, but I would love to have a better harvest so we can eat healthy and save money! Please enter me! Thanks! I really want to start a garden this year, but have NO IDEA where to start! This book would be an awesome resource. Have large family and we need to save the money. Last year’s garden was fruitful but it doesn’t give glory to God when we waste it 🙁 Would love this book!! Count me in! This is definitely something I need to learn more about as we come into planting season here in the south! I would love this book! My father’s garden is always over abundant in food….last year I made applesauce and apple butter that I froze..for the first time! So yummy!!!! I am looking at starting a garden this yr with my kids and possibly start canning things. You are a great inspiration! I would love to read your book. Our vegetable garden was pitiful last year. Regardless we are trying again and this book would be fantastic! We just planted our raised bed garden yesterday! Tomatoes, cucumbers, onions, zucchini, beans, strawberries and herbs. I’d love to learn to can and preserve to captures some of the summertime goodness. We skipped a garden last year and boy do I regret it. Looking to do a big one this year so this book would be AWESOME! This is our first full gardening season at our “new” home, and we already have the area picked out for our gardening adventure. This book would definitely be a great help! I can taste the homegrown veggies already…. Thanks for the opportunity. Feeding our family good food is getting harder and harder. I would love to know how to garden and preserve! I have gardened and preserved since I was a kid. My husband and I are joining a CSA this summer for the first time and are excited/nervous about getting all the great produce preserved for the winter!! We rent, and I just started my organic garden in containers. would love some direction. This book would be handy. I think a book like that would be super helpful! We’ve been doing a small garden for a few years but would like to increase the size and improve the productivity! Also, my mom got me a canner for Christmas so I need to learn all the things I can use it for! Would love this book! I just started canning last year and would love some great recipes and how-to. I enjoyed it, but made some mistakes along the way. Please enter me into this drawing. It would be great to learn this skill from someone! Would really love this book. Eating healthy is so important to my family and it would be great to be able to do it for cheaper! How kind of both of you. I just made strawberry jam and failed miserably. Too much foam. I would love to learn how to freeze vegetables. would absolutely love a book on having a garden and preserving produce for future use! I want tips on how to do this in Florida. I love my basil plant and my two baby strawberry plants. Bring on the knowledge! I would LOVE to learn more about growing my own garden. I promise I’m going to do it every year and then I talk myself out of it! I have had my eye on this eBoook by Laura for a long time! Her blog is such a delight! Sure would love to learn to can!! Just freeze my sur, which doesn’t last long in limited freezer space. Would love to have some help to start my own gardening. I would love to win! My husband and I have been gardening for many years but have not done much canning. I have been learning from my mother-in-law and plan on doing more this year. I will be unemployed in a couple of months and we need to do whatever we can to save on our groceries. We moved to the country back in September and were unable to produce a garden. We are hoping this year will be an extra special year with our new space and our new home. I am just learning to garden, this is my 3rd summer at it. I would love to win a book with some tips and tricks to preserving. We would so enjoy this book! We have some property we can better utilize and I’m always looking for ways to save money and provide healthier living for my family! I would love to win this – and start a garden. This sounds like a great resource. I would like to win! I would love to learn how to do some of this. I’ve been thinking I should start gardening and canning now that we have a big yard. This book would be a great start! My grandma always had a huge garden and would can everything at the end of summer; green beans, stewed tomatoes,pears, you name it she probably canned it. She made fabulous freezer jelly too! I would love this book. I need to start canning and freezing my summer goods because the winter ones from the store taste horrible and are so overpriced!! My husband’s work has been so slow and we really would love to start organic gardening. Hi, Im the mother of 6 boys and a dinasaur sized husband… I would love to get this book ~ or Im going to have to buy stock in Giant Eagle(our local market) lol.. I would truly use this and we would truly benefit from this. I have been learning and trying to grow a garden and perserve the past two years. Last year wasn’t as prosperous as I wanted, because I had my third boy in August. I am so excited for this year. Tomorrow I plan to get out in my garden and till the compost and soil. This book would be helpful in my continued process of learning! Thanks for your inspiration! I would love to win this ebook! Oh, what an awesome sounding book. I would love to win one. We are planning on having our first garden this year. I’m so excited! I don’t have black thumbs…I have black HANDS! I SOOOO want to learn how to garden and tend to it properly as well as start doing my own canning. this would be an EXCELLENT way to start! Thanks both for the offer! This will be the first year we will be able to do a small garden and I REALLY want to, but I don’t want to wait too long! I have been looking for advice and so excited to find this:) Thanks! I would love this! I am working on my 2nd garden ever and so ready to make lots of goodies! This would be sooo helpful, my daughter and I want to try gardening but really have no know-how. This would be oh, so wonderful! I’d love to win a copy of this book! We are a family of four, soon to be 5 by adopting a 7-year old girl. We are planting a new garden and need the tips on preserving! Thank you! I’d love to be entered in this contest. I try gardening every year. But the profits of my labor are never much. I’ve never tried canning, but I would love to learn how. I’m planting my first garden this year. I can’t wait to see what God creates! I want to learn how to can!!! I would love to win this!! We love to garden and would really enjoy this book. Thanks! I would love to have a copy of this book! I am very interested in learning about gardening and canning. I used to help my parents and grandparents when I was a child and would like to know how to do it now. Heavenly Homemakers is a great blog! She’s such an encouragement and I’ve found tons of useful info on her site. Sounds like a great book as well, and I’d love to put to utelize the knowledge she shares. Gardening is my passion, preserving the bounty is a on-going learning process. I would this book for just that reason. Love your pictures of your bounty! I would love to win this book. I have gardened in the past. It is just my dh and I now, but I am urged by God to grow a garden again this year (and I miss it also). With working 2 jobs this will be a challenge, but this is what we need to do at this time. Thanks for the opportunity! We just purchased a home and are starting a garden this year. I am excited, but sure could use her helpful tips. Thanks! I used to do a lot of gardening & I loved it! Hoping to get back into it. We are working on building a garden and need some help. I do can peahes and salsa every year and it makes a huge difference. Thanks. Great article…gets me motivated to can even more! Thanks! This is my first garden this year. We’ll see how we do. Thanks for all the info. My family and I love to garden and can not wait until the time comes to turn the garden over and get ready to plant. Great encouragement for getting a garden going! I am moving to Alaska and looking for a way to save on groceries in a higher cost of living economy. YAY! great guest blogger article….we have a fam of 6 and started gardening..lol it was a good start but i cant wait for the day where i can have an abundant garden and cans of food. This was a great post. Thank you so much. I love to garden but don´t know much about how to store it. Would love to win this book to read and learn more so that I can take better care of my family and budget. Would LOVE to win this book. Used to can and preserve all summer long with my mom and grandmother and I’m just starting to get back into it. I would love this book! I started doing this last year and could use some tips! I would love to start making everything from scratch. I have never canned anything but I do put things in the freezer would love to learn how to can. I definitely need this! For the first time, we’re attempting to grow our garden. Indoor seeds are going, almost ready to plant potatoes. I’ll also need to learn about canning/preserving. Lots to learn this summer! We have a garden every year too. I love the freshness & the convenience. I usually jar salsa, but would like to expand that this year. Thanks! I garden every year and it seems like so much goes to waste when I don’t can or freeze. I would love some news tips and how-tos from a different source. It would really help my family out to win this book!! Even though my parents grew up farming through the depression, i am struggling to learn how to apply what they taught me with todays world. Please keep posting the gardening & canning tips. This book would save our butts! Newbie gardener and preserver…. 😉 Any help would be great! I’m so glad you are doing this! I’ve been wanting to garden but don’t know where to start. Thanks! I have wanted to garden, but don’t know where to start! Help! We are planning our garden and what we want to preserve for ourselves this year. This book would be great! I would love a really good book on preserving. I inherited over 6 dozen canning jars and am ready to put them to good use from the the bounty in my garden. Thanks! I would love this book, I am so interested in growing our own food. My dad did it when I was a kid and it was very good bonding for the family and the fruits and veggies of our labor were always delicious. We are planning our first garden this year and this would be such a big help. Wow I would love this! Great giveaway! Thanks!! This would be so helpful to me! Thanks for the giveaway! My boyfriend’s mother passed away last year and his fathr gave me BOXES and BOXES of old canning jars because I told him I wanted to start canning stuff like his wife did. My boyfriend grew up on a dairy farm and they lived on the frozen and preserved crops all winter. With his mom gone, we’re on the last jar of green beans and I can see how sad it makes him. I would like to bring back those happy memories by recreating that for him. And I need help to do it! This book would help me do that. Thanks for all you do! I have always wanted to start canning. This post is inspiring. Whoops! Mistyped my name and email address above! Too much hurrying! I would SO love to win this!! I really want to start doing this and a guide would be awesome! We are planning our first garden this summer. I would love to win! Would love to garden and preserve like this. Sounds awesome! This makes me so excited! I am trying to do this for my family right now, learning as I go! I would love a copy of your book! I attempted to grow some stuff last year with no success! Believe me, it was pitiful!!! I am so excited about this book. This is going to be my first summer learning to garden, can and preserve our food!! Looking forward to a new adventure! We bought our first house last April. With the house came a small garden, but I have no clue what to do with it. We were so busy last year with moving, that we did no planting, just weeding the flower beds and harvesting raspberries. This year I am planning to do quite a bit more, but need help figuring it all out. This book would be a great help. I’d love a to win a copy! we’ll start to garden this summer! I would love to have her tomato soup recipe & the book of course! I love to can! Thanks for sharing, we garden and can….would love the book !! I can’t wait to have my own garden someday (I currently live in an apartment and I can’t use my yard to plant a garden) and I would love to learn how to preserve fruits and vegetables! I have 4 young daughters and am so excited to be starting our first garden with them this year. My biggest concerns are knowing where to begin and what to do once its started 🙂 I would love a copy of your book to help answer my questions and help us grow the healthy foods God intended for us to have. And, when I am finished, I will pass it on to a friend to help them as they begin their own! Thanks for your generosity! I would love some help in making my thumb a little greener 😉 Great giveaway, thankyou! Over the last couple years I have become more and more interested in growing our own food. I would love to buy all organic but can’t afford it so growing our own sounds fabulous. I would love a book like this. Thanks! Oh this would be such a help! Thanks for the chance! I would of copy of this! Thank you for all you hard work!! I would love to winr this book! I would love to stock up for winter! I would love to win! Nothing better than home grown produce! Would love to read this ebook! Thanks for the opportunity! Would love to win this book as I have been doing much research on this subject and would love more wisdom! We started gardening last year, and I am trying to learn more about it. I would love to take a look at that ebook. Would love to win a copy! Thanks for sharing these. Now that we own a house, I’d really like to start a garden. I hope I win. I would love a copy of this book! We are just planting our starts in the house now-I have done some tomato sauce canning and pickles before-but would love to get more info. We finally were able to buy a house last October and I have so been looking forward to planting a garden! Believe me I need all the help I can get, I’m clueless when it comes to gardening, but I can’t wait to eat what I plant & can some of it too! Oh! I so want to win this! We just bought our first house and finally have space for a garden. I have started some seeds inside and would just absolutely love this book to help me make the most of my garden!!! I have wanted to start a garden for a few years and thought it too daunting. This would be really motivating!! Great giveaway! I’ve been doing a garden for the last two years, but I sure could use a little guidance! Sounds like a great book! I would love to learn more about preserving. I am pregnant with our first child and I am really looking for ways to save and eat healthy. Thanks! Thanks for sharing your insight and wisdom with us! Thank you for the guest post! This book would really help us to use all of the food we receive from our new CSA membership this Summer! I am getting ready to plan our garden. What a great help this would be! Thanks! Hello! I really could use that e-book! Last year my husband and I dug out a 12 by 12 garden (digging through Carolina clay was quite a job!). We amended the soil, followed the directions on the seed packages, and did not do very well. We are trying so hard to lower our food bills, we could really use the gardening tips! Thank-you for your consideration! Just starting our garden for the first time, this book would be wonderful! I love organic produce and really want to learn how to grow and preserve them!! PLEASE!!! I would love a copy of this book! We are expecting our first child so I am really wanting to find an inexpensive way to eat healthy! My first garden completely flopped and I think I’m ready to try again! I’d love the help from such a knowledgeable mom!! I have started gardening 3 years now and try to learn something new each time. I have 5 kids and try to get them in the garden as much as possible and it has become even more fun than flower gardening. One of my goals is to try to learn about the art of canning and preserving my produce for our family the whole year. This book sounds great, thank you for offering this. i would love to start growing my own produce to save on grocery bills. i plan on a garden project this spring/summer and have my daughter pitch in. this book would help tremendously as i don’t know where to start. thanks! I tried my hand at gardening last year, and my flowers survived but veggies did not. I’d love this book to help me along the way and keep us eating veggies/fruits throughout the winter! Would love to win this book! Just getting my seeds started…. I cannot wait to read more of the website, it is wonderful to see how you can save money, involve the family and eat healthy. I am looking forward to learning all about it! Third year at gardening, still working out the kinks. Would love to grow enough to can and freeze the leftovers! I’d love to be able to win. I am starting a garden this summer and could use as much information as possible. Thanks. I would love this! We’ll be moving into our first home soon and I’ll finally have a yard to start growing a garden in! I definitely have a lot to learn though. With the unpredictable growing season in Colorado I need to be ready to pick and preserve anything that does grow. I need to learn how to do more than peaches, apples, and zucchini. wow! this is so inspiring! i have tomato seedlings started right now…canning would be a great idea! We’ll finally have a house with a yard this year, so I would love to win a copy of this book! would love a copy of this book. laura always has such great tips and suggestions. We just started our pantry – a book for help with preserving would be fantastic! Now that our daughter is eating table food we’re really watching what we put on our table. I’m so excited that we’re starting our first garden this year!! This book would be perfect :)! I’d like to garden and preserve food, but it is awfully intimidating. Maybe this book would help! My husband and I had a great garden last year, but didn’t know what to do with all the leftovers. I froze onions, peppers, and what not, but need to learn about the canning!!!! We just bought a house with a little bit of land and I would LOVE to get started with a vegetable garden. This book would be most helpful as I am totally on par with Laura’s philosophy. I finally have a garden space but need help! This would be perfect! As a newlywed and soon to be mom, I am very excited to learn about canning and preserving fresh fruits and veggies. It seems to be a lost art in my generation and I look forward to the opportunity to bless my family with delicious foods year round! We only have a small square in the front yard. Back yard is cement! Yuk. Don’t ask. Tomatoes were a bust last year. Would love to have room to do potatoes. I keep asking God. Perhaps some day. Would love the book to help me do what I can. I would love to win this! I love the Heavenly Homemaker blog! Thanks Laura and Crystal! Thanks for the chance….I need all the help I can get. Ive started a strawberry plant in a pot. I live in a apartment with little sun on patio. I hope it grows. I am looking for a house and would like to have a garden patch.This would be a great book. I would love the canning portion but in Las Vegas, gardening is not cost effective- too much water needed. I really want to start a garden this summer. I’d love to win! This year is my second try at a garden, so I would love this book! I would love this! I’m really trying to learn more about gardening. I would love this book. I started my first garden last year and I’m hoping to go bigger this year. I would love to can more of my own harvest. What a great gift to win! A friend sent this post to me and I can’t wait to read more from you! We garden but I have never canned and would love to try. The book looks like a great resource! I am brand new to gardening and would love to get some advice! Thanks! I raise a garden every year. I would love to learn more about preserving my harvest. I used to help my mom in the garden while I was growing up and we’d can lots of the vegetables. We’ve put in a small garden the last couple of years and I’d really like to start canning some of it this summer so this would definitely come in handy! We want to start a garden this year! Winning this book would be helpful. I would love this book. I have only dabbled in gardening, a few tomato plants each year. I was just looking for information on this topic today. Perfect timing. Hope I win! Thanks! I would love to learn how to do that! I canned some jam and applesauce last year, but that’s it. I’d love to learn how to grow my own food and can it as well! We’re finally going to plant a garden this summer and we’d like to preserve as much as we can. This book sounds like it has lots of great tips. Our family decided last summer that we would start a garden this spring. We have never done this but the kids are anxious to get started. We would love to learn any tips you could give us. Thank you for sharing what you have learned. I have been wanting to start a garden and have no clue how. This book would be great to get me started! I am starting my first garden this year! I would love a copy of this book! I would love this book! I’m such a canning novice. We just started a square foot garden this year and I am so excited to have our own veggies and fruit (strawberries)! It is such a fun process but I have so much to learn. I would love a copy of your book. I don’t have a very green thumb and could use some help. I’ve heard about ‘square foot gardening’ and just borrowed a book from our public library. I’d like to start teaching my children about gardening and the benefits of having home grown produce. My hubby gardens for us each year and I have really wanted to start canning. This would be a great help! I would love to win this book, too! We already can and freeze, but I’m always looking for new resources and new ideas. Great article! I would love a copy of her book! I have been saving jars since last fall from various items so I can start canning this summer 🙂 I’m a total newbie at canning though. Hopefully # 831 is lucky. We garden regularly but don’t can. This looks like a good way to learn how. I am an avid gardener, but I am always looking to learn more ways to preserve. This book would be so helpful. I love Heavenly Homemakers!!! Hi! My husband is all into the square foot gardening and wanting me to cook organic; I haven’t done much – I’d love to learn from you. Sounds like an amazing book. Thanks! I am a beginner gardener. Last year was my 1st year and I loved it. This year I am going to learn how to can and freeze all my hard work! I love knowing where our food comes from. To help my veggie adverse boys, we are planting a garden full of vegetables and starting a small strawberry patch. I hope by them seeing how stuff grows and participating in it, that they will take more pleasure in eating it too. My youngest has a severe gag reflex as well as food sensitivities and continues to eat some baby type food at age 7. I hope by learning how to can and preserve sauces made from our fresh veggies and fruits to help him be more successful with eating as well as try new foods. Thanks for the chance to win the free book. I loved her segment on gardening and would love her book! I would love a copy of this book. I am learning this year to make the most of our small garden. I’ve been buying jars at garage sales all winter long! My son has been begging me to plant a garden and I would love to do that with him, but I have been afraid to start and wondered what we’d do with all the *extras*. Canning seems so hard, but you make it sound easy. I think this book may be just what I am looking for. I’d love this book. I’ve been gardening for a couple of years and I’m really hoping to get into canning this year. I’ve been nervous to start and I think this book would be so helpful! my MIL got me into preserving, can’t wait to start! I would love to learn more about preserving our fresh fruits throughout the year. Sounds like it would be a great book. I am hoping to preserve more of our organic garden this year. How wonderful I love to garden but am new to preserving! I could really use some good gardening advice. I would love to start doing this! I would love to read your book! I’ve really enjoyed following your blog for many months now. We’ve gotten a Burkey water filter and now we have a grain mill on the ‘wish list.’ I started canning (first time as an adult) last year and got a pressure canner for Christmas…yeah for doing veggies now! We are getting so much better about eating local, organic, real food, not that we were ever terrible, but our baby steps are making things better and better all the time! If only Azure delivered in our area. This would be a wonderful book to have! Thank you for offering it! I’d love to learn more about home canning! I have a garden every year but I’ve never tried to preserve anything. I am usually just sad once the MN fall moves in and we have to mulch over our garden until next may. This year I would love to try preserving some of our wonderful produce! We are starting our organic garden, I would love to learn about canning. I’ve got the garden thing down. Now I just need some advice on canning! I am always on the lookout for gardening advice! I would love to win! I can use help in the area of gardening! This is all new territory for me. I would love to have a copy! I had an ok garden last year, but hope to have a much better one this year! We tried gardening last year and failed miserably. We are in a large city with a tiny yard so we are trying to think of how to be creative with our space. I’d love a copy of the book. We started a garden last year, but it needs a lot of improvement. This book would be a great resource for me! We’re just learning how to eat a healthy, plant based diet without any preservatives or processed foods. It’s been a challenge and I still feel like I’m far behind where my family needs to be. My 5 month old is really sensitive to processed food/preservatives so I need help so she can sleep through the night and so my other kids can get off their addictions to it. They love the idea of a garden and I think if I can do it, they will learn to love the good food because we worked for it. My attempts at plant growing have not been very successful and I’m in desperate need of help! Wow! would love to know how to garden and can! I need help with my preserving. I would love the book to see if I could get food preserved that my family would actually eat! I am plotting out my new garden and would love to have this book as a guide. I have checked out dozens of books on nutrition and gardening from the library but haven’t read anything on preserving what I grow or farmer’s markets. My yard, like the author’s is to small to grow everything and I’d love to see how she gets around it. my garden always fails. i need help! I would love this ebook as I am working on my garden plan! Laura’s efforts and book sound great. I will give this book to a friend if I win, because she struggles with her garden every year, and I would love to help her out this way! My goal is to start a garden this year. We just moved and have a huge yard, so I’ve become inspired. I would love the book. I can use any help possible to overcome my black thumb! I absolutely love to can, especially tomatoes. there is nothing like the taste of home grown tomatoes in december! Love gardening. It’s such a good feeling to know you’re providing the best for your family. A neighbor was just asking me questions about gardens the other day; my philosophy-if it’s something you’d like to try to grow-try it. If it comes up, great, if not find something else to try. I can green beans and tomato sause. I would love to learn how to can and freeze more to save more money! We are tilling the garden this weekend. Yeah Spring! Oh I would love a copy and any words of advice – gardening in the clay and the desert. Please enter me. I am not sure if I am too late, but I would love to win a copy of her e-book. I am doing my first garden on my own this year (I tried last year but was not successful). Thank you for the chance! I would love this! I swear every year that I am going to do better at getting my garden going earlier. I love hearing about other gardener’s efforts! I have had a vegetable garden for the last three years and I love trying new veges. I was so bummed when we had a huge hailstorm last year and wiped it out. I am going to try “8 ball zuchinni” again this year. It’s a round squash, and like all zuchinni, it’s a snap to grow. I haven’t tried canning, but with some encourgement, I think it would be fun to experiment. My black thumb would appreciate the help! Me too! I saved my seeds last year and will plant them this weekend. I can’t wait to see how they grow! I just wish I had been better about keeping the little seed packets. Live and learn! And, read and learn! I have always wanted to know how to can. Would be cool to win! I have endeavored to learn new things and apply them to my family life in 2010. With several health issues plagueing us, eating more healthy is goal number one. I would love to receive this book, in hopes of improving the quality of life for my entire family!! Just put up a ton of strawberries, but looking for more inspiration! Thanks! I really would like to start a garden and winning this book would be wonderful! I would love to receive a copy of her e-book. yup this is what i need! I love gardening, but have so much to learn. I would love this book! Would lve to add this to my arsonal of living off the land. We have a new home with a 20×20 garden plot now I just need to plant something. This book would be wonderful! Thanks! I would LOVE a copy of this ebook! I have been DYING to start my own garden, so I can provide fresh fruit and veggies for my family! But alas, I have a black thumb and need all the help I can get! Thanks so much! We would love to have this book to had to our library. I am so glad I saw thing as my husband and I have decided to unlock our green thumbs this summer. I am a little nervous about this venture and trying to learn all I can! I would love a copy of this book. This is our second year with a garden and I’d love to be able to put some away for the winter months! Thank you for the offer! I will love to have this book. I’m trying to have my own produce and I need to learn more from you, thanks for all your help and tips! I have ane 8yr.old and a 11 yr.old both boys! I strongly desire to start my own garden, but feel overwhelmed and don’t know what is the best way to do things. This ebook would be very helpful. Thanks! Sounds like a great book to read. You can always learn something new! Need all the help I can get. I want to grow a big garden, but don’t know where to start. I gardened last year but it was struck with some sort of blight. I would love to learn how to can things and this book sounds like a good place to start. Great giveaway! I would definitely put this book to good use as I try canning for the first time this year. Thanks! I am happy to see more blogs talking about gardening and canning. We can/freeze/dehydrate the produce from our garden and it lasts through the next gardening season.